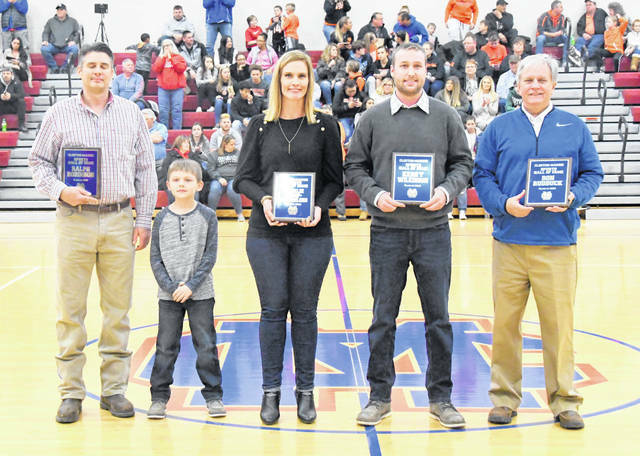 The 2019 Class of the Clinton-Massie Athletic Hall of Fame was inducted Friday night prior to the varsity boys basketball game against Wilmington. The inductees were Ron Rudduck, Kerry Wilkinson, Natalie Kemp Harmeling and Ralph Robinson. From left to right in the photo are Matt and Luke Robinson representing Ralph Robinson, Harmeling, Wilkinson and Rudduck. https://www.wnewsj.com/wp-content/uploads/sites/22/2019/01/web1_HOF_cmclass2019-2.jpgThe 2019 Class of the Clinton-Massie Athletic Hall of Fame was inducted Friday night prior to the varsity boys basketball game against Wilmington. The inductees were Ron Rudduck, Kerry Wilkinson, Natalie Kemp Harmeling and Ralph Robinson. From left to right in the photo are Matt and Luke Robinson representing Ralph Robinson, Harmeling, Wilkinson and Rudduck.